While adaptogens are certainly not new (their use originates in ancient Chinese medicine and Ayurveda) they have become increasingly more popular in the Western world lately. But what are they, actually? Adaptogens support your body’s adrenal function. Think of your adrenals as your body’s pedals for stress hormones. When you face a stressful situation - you want to jam on the gas so they pump out hormones to help you react. When you’ve calmed down - you want to hit the brakes so the hormones stop (make those adrenaline jitters go away - PLEASE). Adaptogens help your adrenals react FASTER, so your body spends less time and energy producing hormones that you may not need. Long story short, adaptogens are herbs that help improve the health of your adrenal system, which in turn helps your body process and cope with stress, anxiety and fatigue. We want to get these in our diet, stat. But in lieu of adding another step in our morning routines - we reach for REBBL to get our adaptogens in. 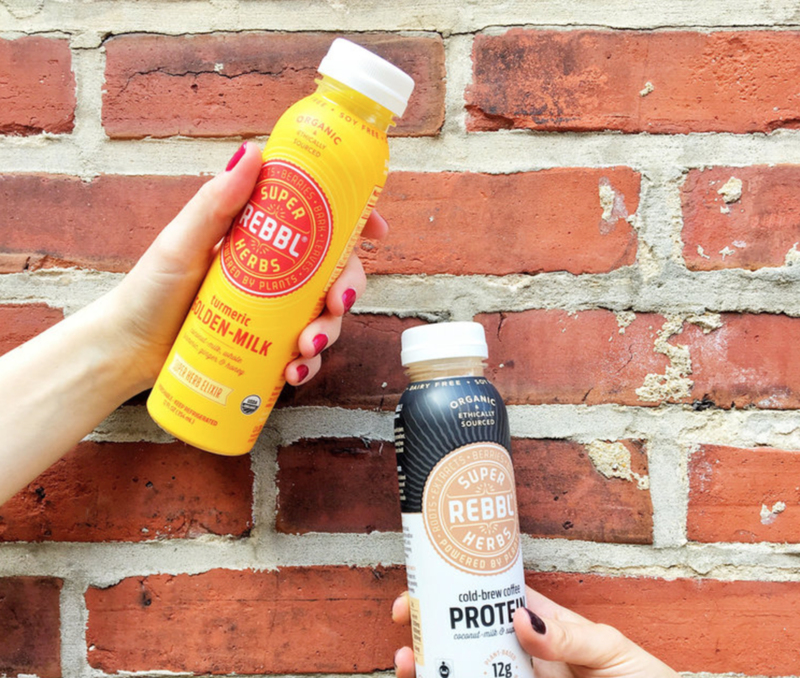 REBBL’s elixirs and protein blends not only taste unreal, they are organic, fair trade, and made from only real ingredients - no fillers, thickeners or chemicals. They have different elixir mixes to reflect different adaptogens (reishi chocolate, ashwaganda chai, turmeric golden milk - um, YES please) plus a new line of protein packed elixirs that are a perfect (completely plant-based) post-workout drink. On top of their can’t-get-enough flavor and being made from ingredients you can really feel good about - their mission as a company makes this purchase that much easier. REBBL is unbelievably transparent in the source of their ingredients - which is super hard to find in most products that stock our grocery store shelves. You can trace the source of REBBL’s ingredients on their website - and they only source from supply chains that invest in the wellbeing of their communities (think medical care, safe housing, and clean water). In addition, REBBL donates 2.5% of revenue to the non-profit, Not For Sale, to support regions of the world that are vulnerable to exploitation and human trafficking. Could this company get any cooler? 1/2 tablespoon cinnamon (optional) for added spice! To make: Add all ingredients to a mason jar or container with a lid, and shake well to combine. Refrigerate for 3-4 hours, or overnight until thickened. Enjoy with fruit, chopped dates, coconut flakes, or any topping you'd like! To make: Mix the chia seeds and REBBL and whisk well to combine. Refrigerate for at least 2 hours, or overnight until chia pudding thickens. Top with banana, coconut flakes, or other fresh fruits and enjoy! How simple are those 5 minute breakfast options?!? When we work with companies and products, we limit ourselves to companies that reflect our mission and values. REBBL takes that partnership a step further - their business model is what we aspire to become one day. So here’s to grabbing a REBBL, getting in all the adaptogens, de-stressing a bit, and enjoying giving some love to ourselves AND the world.